The enterprise network has long been treated as plumbing for the technology that powers our lives. It's one of those things where as long as the bits are getting where they need to be, nobody needs to look more closely. Wrong! That's where ExtraHop comes into play, delivering a top-down workflow that enables IT teams to go from real-time performance metrics for application, security, network, and business services to associated packets in what they describe as "five clicks or less." This streamlined workflow transforms the network from a commoditized transport function into the richest source of real-time insight. The new capabilities found in ExtraHop 6.0 give customers comprehensive visibility into end-users' digital experiences and so much more. To dig in deeper, I spoke with Nick Brackney, Product Marketing Manager at ExtraHop. VMblog: You just released ExtraHop 6.0 - What are the most significant updates and what makes this solution unique? Nick Brackney: Building off of our platform's turnkey streaming wire data analytics, this new release offers the industry's first top-down workflow, giving users the ability to trace down to the details of specific digital interactions and gain real-time performance metrics in five clicks or less. In virtual environments, this is critical as troubleshooting a problem can be difficult with so much abstraction. In ExtraHop 6.0, we've added continuous packet capture, which has traditionally been a key capability for network teams. By tying these packets back to the transaction information within our platform, we're making analysis of the data even easier. This will fundamentally change the way network teams manage performance and availability and make it easier for IT Operations teams to collect the data they need. In addition, ExtraHop 6.0 now includes integrated NetFlow analysis and SNMP polling. These data sources can deliver important information about the physical layers of the network, which while becoming less prominent in the software-defined data center, can still yield valuable information that helps keep the environment operating. VMblog: What challenges does this solve in the modern IT landscape? Brackney: Organizations are seeing every function of operations go digital. IT has to support an incredible number of services, and it's making the job increasingly complex. Traditional methods of monitoring an endpoint or instrumenting an application are failing to provide a complete account of the digital experience for users. And in the era of the software-defined data center, where applications are more distributed across micro-segments, the ability to monitor all the transactions between systems becomes increasingly important. By using ExtraHop to extract rich data from the network, we're able to see the entire application delivery chain and every interaction happening across all systems. The ExtraHop platform automatically discovers devices, systems, and their relationships; observes and measures their behavior; and rapidly initiates a forensic investigation of performance and security problems by drilling down to the packet level. We give customers a streamlined workflow that reduces the time to obtain insights, making it possible to achieve the outcomes they are looking for faster. VMblog: In your announcement, you challenge business and IT leaders to "rethink the network." What does that mean, and why is it important? Brackney: Traditionally, the network has been seen as transport - nothing more than plumbing. This is particularly true for roles that have little experience interacting with networking. We want to change how people think about the network, so it's seen for what it really is: a first class data source. Ultimately, everything transacts on the network. It is the single largest source of real-time information about every digital interaction in the enterprise, from communications between servers to a text message sent, an order filled or a patient receiving care. In the complexity of IT, it's the one common denominator. By tapping into it, IT teams can extract incredibly useful real-time data. If you're only relying on logs or instrumenting applications, you're missing out. This new level of visibility will greatly help VMware admins better guarantee their service levels and eliminate issues before they become widespread. VMblog: What are your customers saying about the platform? Brackney: Many of our customers are excited about the new benefits of 6.0. Here's what George Beech, Site Reliability Engineer at Stack Overflow, one of our beta customers, had to say: "Stack Overflow is the largest online community for programmers to learn, share their knowledge, and advance their careers. When the online forum is having performance problems, you can bet that we hear about it. ExtraHop plays a critical role in supporting our community's digital experience by helping us proactively spot performance problems before they impact our users. The new workflow enabled by 6.0 gets us the last mile in record time, surfacing issues and getting us to the specific packets tied to that problem in a matter of seconds." VMblog: What kind of users will benefit most from this solution? 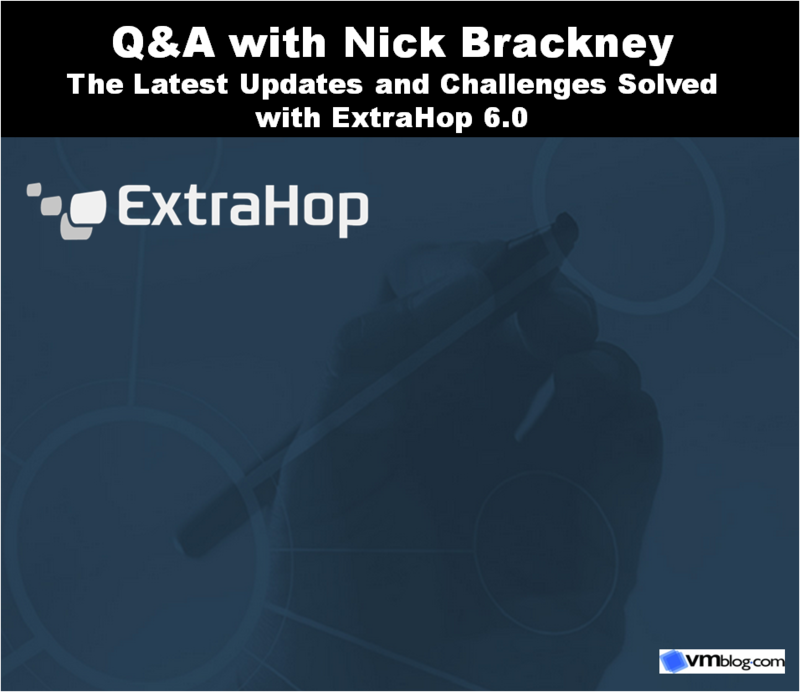 Brackney: The capabilities offered by the ExtraHop 6.0 platform benefit users across the enterprise who are seeking to identify and solve issues faster. It provides application and IT ops teams the data they need to support a seamless digital experience for end users. It gives security teams the insights they need to assess risks and anomalous behavior in real time. For network teams, the top-down workflow dramatically reduces the average time-to-resolution. And business decision makers are equipped with a single platform that delivers the real-time insights they need to take data-driven actions critical for modern businesses to serve the needs of customers and remain competitive. VMblog: How does this solution fit into existing workflows, and how long does it take for businesses to achieve results and/or reap the benefits? Brackney: ExtraHop 6.0 allows users to see the big picture of what's going on in the environment, explore individual transactions, and ultimately trace it all the way back to the source. These capabilities are important, because the concept of "workflow" is very different depending on what type of task users are performing. For example, if you're monitoring for ransomware, you'd benefit most from real-time dashboards that provide insights across the entire environment. However, if you're a helpdesk person dealing with an angry CEO calling about poor VoIP performance, you'd want to search only for the conditions that were directly present for this user during a specified time. Finally, if you're on the networking or security team, there may be instances when you need the actual packets in order to provide evidence to a vendor. With ExtraHop, you can start at any point in the workflow, use the same user interface and console, and get to these answers in just 5 clicks. Once again, I'd like to thank Nick Brackney, Product Marketing Manager at ExtraHop, for taking time out to speak with VMblog.com.